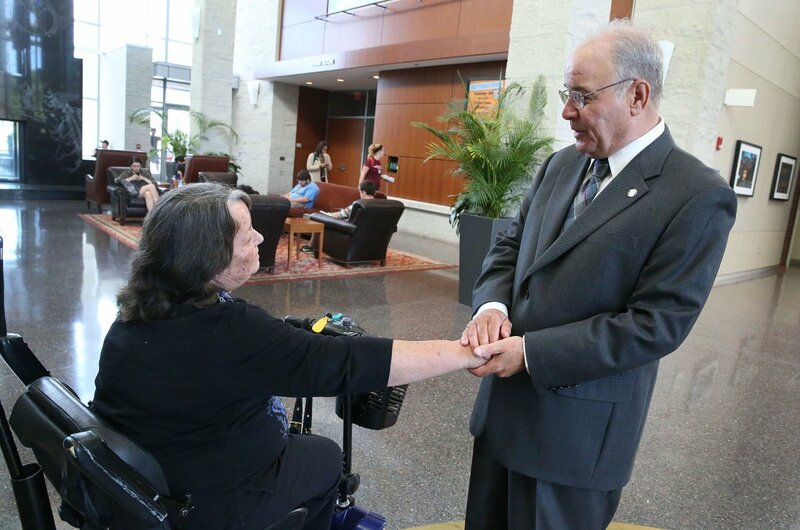 Stockton University interim president Harvey Kesselman, introduces his wife, Lynne, during a student senate event at the college, in Pomona, Friday, Sept. 4, 2015. Stockton University interim president Harvey Kesselman speaks during a student senate event at the college, in Pomona, Friday, Sept. 4, 2015. Stockton University interim president Harvey Kesselman chats with students and faculty during a student senate event at the college, in Pomona, Friday, Sept. 4, 2015. Stockton University interim president Harvey Kesselman chats with students and faculty during a student senate event at the college, in Pomona, Friday, Sept. 4, 2015. At left is Maryam Sarhan, a student on the college's board of trustees. Stockton University interim president Harvey Kesselman shakes hands with a student he is mentoring, Maurice Brandon, of Atlantic City, during a student senate event at the college, in Pomona, Friday, Sept. 4, 2015. Stockton University interim president Harvey Kesselman talks about the college's plans for the Showboat Casino, on screen in rear, a proposed site of a campus in Atlantic City, during a student senate event at the college, in Pomona, Friday, Sept. 4, 2015. Stockton University interim president Harvey Kesselman chats with faculty and students during a student senate event at the college, in Pomona, Friday, Sept. 4, 2015. Stockton University interim president Harvey Kesselman chats with faculty and students during a student senate event at the college, in Pomona, Friday, Sept. 4, 2015. At right is his wife, Lynne. Lynne Kesselman, wife of Stockton University interim president Harvey Kesselman, chats with faculty and students during a student senate event at the college, in Pomona, Friday, Sept. 4, 2015. Stockton University interim president Harvey Kesselman talks about the college's plans for the future during a student senate event at the college, in Pomona, Friday, Sept. 4, 2015. GALLOWAY TOWNSHIP — Interim President Harvey Kesselman comfortably worked the room, shaking hands with students at the Stockton University Student Senate barbecue, taking time to ask where they are from, what their majors are and why they chose Stockton. He gave a short welcome, joking that he knows enough not to get between college students and food. Kesselman, 64, has only been interim president since Sept. 1, but it’s a job he’s been preparing for his entire 35-year career at Stockton. He arrived as one of the first 1,000 students in the brand new Stockton State College in 1971. The campus is his second home. As the acting, and now interim, president, his appointment as permanent president is not a done deal. Kesselman makes no secret he wants the job and many on campus hope he gets it. If the trustees want to do a national search, he says with a grin, he is confident he can beat the competition. In the meantime he is turning Stockton into the university he believes it can be. He already has a committee working on a new mission statement. “I want us to be a premier public institution,” he said. Stockton may be a public university, but it’s also Kesselman’s baby, one he has helped raise from infancy to university status. Stockton also nurtured him, from a long-haired student in jeans to the president’s office, where he has hung a portrait of the old Mayflower Hotel in Atlantic City, site of his first Stockton classes. The youngest of four children, his mother finished high school, but his father left school after eighth grade. He was the first in his family to attend college, and talks about wanting current students to have the same opportunities he had: first-rate academics, a nurturing environment, community involvement. He first passion is teaching, his motto “Students First.” His enthusiasm is infectious. It has been a tumultuous year for Stockton since the ill-fated purchase of the former Showboat Casino and plans to convert it into an Island Campus imploded in a controversy over dueling use covenants. Herman Saatkamp resigned as president in April. Kesselman, then second in command as provost and executive vice president, had planned to leave to become president of the University of Southern Maine. Then, after all the farewell parties were held, Stockton’s board of trustees asked him to stay, and he agreed. In a way, Stockton was made for Kesselman. He had been accepted to Rutgers. But one of Stockton’s founding administrators, Chuck Tantillo, convinced him to try the brand new state college that didn’t even yet have a campus. Kesselman also liked that Stockton was a place that would treat students like adults, giving them a say in how it was run. “He had a beard and long hair, and he’d be walking really fast, and there were always students gathered around him,” she said. The beard and long hair are gone, but Kesselman still moves fast and is legendary for his long hours, boundless energy, and 5 a.m. (now 4 a.m.) emails. “I don’t sleep a lot,” he admits. A resident of Mays Landing, where he and Lynne raised their children, Megan and Aaron and daughter Danielle from a previous marriage, Kesselman served on the Board of Education and the Township Committee, where he held public strategic planning meetings to get residents’ input on township priorities. The children excelled in school and sports. Lynne and Harvey spent hours in their Toyota Highlander driving to practices and meets and games. Megan was valedictorian of her class at Oakcrest High School, where the Kesselmans helped start the crew program. Aaron graduated from a high school in New Hampshire with a national championship ice hockey team. Both attended Princeton University. Danielle has a law degree from Rutgers. Lynne, a former day trader who left to fulfill a dream of teaching, was named New Jersey’s recipient of the national American Star of Teaching Award in 2008. She has a bachelor’s degree in business and a master’s in Instructional Technology from Stockton and jokes that she has two Stockton degrees while her husband just has one. She has given up her teaching career, but has already begun a Women in Philanthropy project as Stockton’s First Lady. 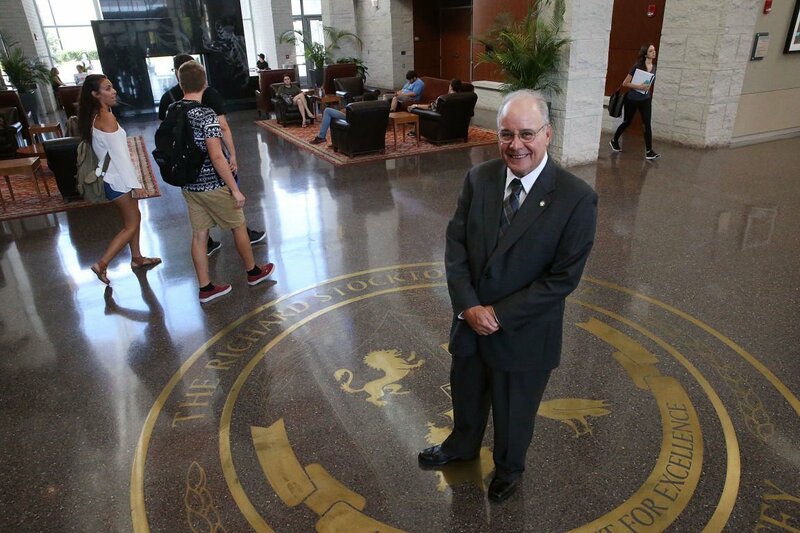 His popularity on campus — he got a standing ovation at the fall faculty meeting — comes from his ability to take charge in a crisis while also bringing others into the process, the shared governance model prized by faculty. He views leadership as the ability to empower others. Kesselman said he never planned a career at Stockton, but new opportunities kept coming up that were too interesting to pass up. “I’ve loved every job I had here,” he said. Now that he’s in the best job, his focus is on the future. That includes selling Showboat, building new academic and science buildings scheduled to break ground this year, a new county dispatch center, and ongoing issues with housing and parking. Stockton Federation of Teachers president Anne Pomeroy said Kesselman is providing stability at a crucial time for Stockton, and while there may still be discussions of how to decide a permanent president, he would certainly be a top choice. Stockton University will sell the former Showboat Casino Hotel for $22 million to Tower Investments, Inc., headed by CEO Bart Blatstein.